The change in seasons will soon bring cooler weather. That means the start of turning season for many parts of the country. 1. 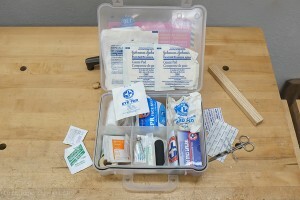 Restocked the first aid kit. Fortunately, I only needed to replace a few band aids. I think it is important to have a good first kit in the shop, even if your shop is in the garage. Also, the kit should be visible and/or your frequent visitors should know where the kit is located. 2. The second most used machine in my shop is the grinder. (The first being a lathe.) I tend to neglect this important machine. 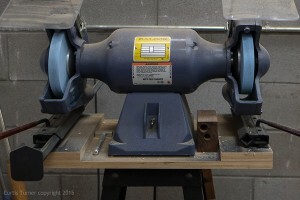 The grinder gets covered in wood and metal dust. The clean-up for me was a quick once over with a shop vac. 3. 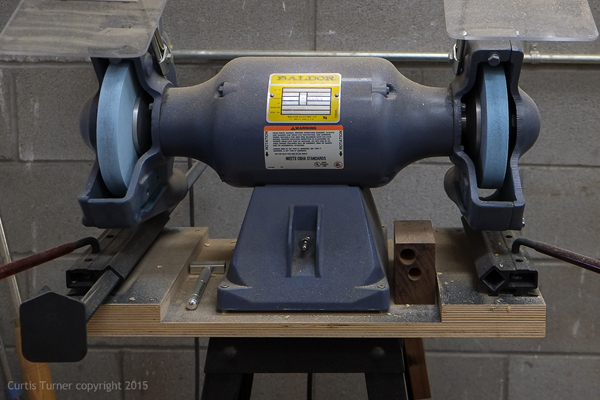 The third most used machine in my shop is the bandsaw. This required a little more effort to clean. However, the time is well spent to protect this investment. I started by vacuuming off the exterior and interior top to bottom. Then I readjusted for the drift. Next, I waxed the table and ensured the guides operated properly. Unfortunately, I noticed rust forming on the blade guard. I used a Scotch Brite pad and Sandflex medium grit block to remove most of the rust. I found the Sandflex block worked the best. You can see the difference in the photos. I then waxed the blade guard to help prevent more rust from forming. 4. This is a reminder for those with heaters in the shop. It is wise to vacuum off any dust that has accumulated on the heater since last year. Wood shavings make for great tinder.